Graphics for the Army Times on he 50th anniversary of WWII. Another artist did an Iwo Jima piece so I put in a bid for the Okinawa anniversary and spent a while researching and drawing. The format of the graphic was copied by U.S. News and World Report later in their graphic on the 50th anniversary of the Atomic bomb including similar side bars on the suicide weapons. I was flattered and still have a copy of their graphic in my portfolio next to mine. It was always surprising to members of the ATPCO art dept. (Lance Marburger, LB Pearl and Scott McClallen) when we saw elements of our work in publications with larger circulations. 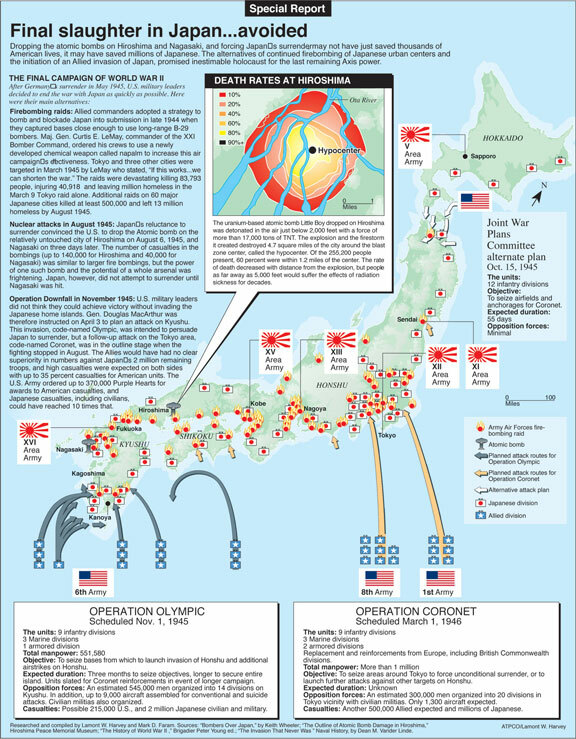 The Battle of Okinawa has since become the most interesting Battle of the war for me. 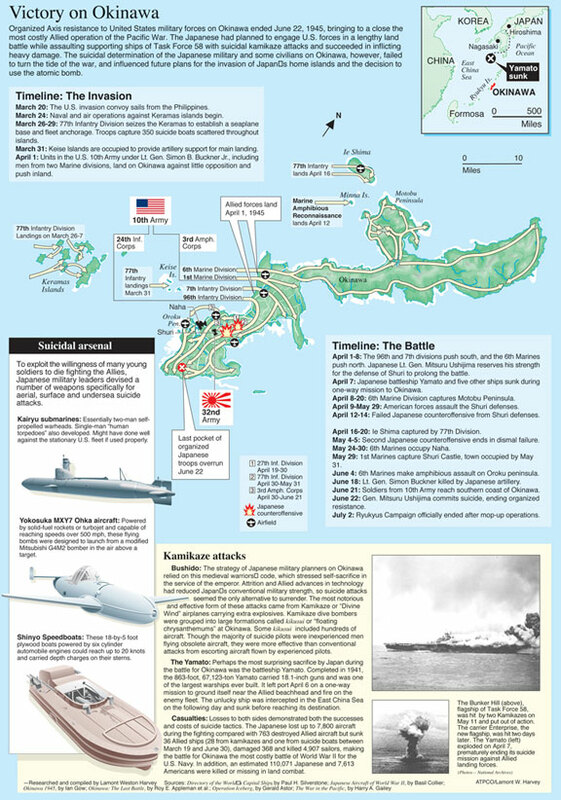 Air Force Times liked the Okinawa graphic and put in a bid for a piece on the atomic bomb anniversary. Other news organizations were publishing their anniversary issues up to a month early to try and steal each other's thunder. This was excessive but it forced me to take a different perspective on my graphic. How many people died from the atomic bomb. How many people were in the process of dying in Gen. Lemay's bombing campaign. How many people would die in the event of an invasion. The object was not to justify the bombing but to put things in perspective and make people think before reflexively protesting the bombing based on modern political views. I had a good source in Louis Belliveau, a retired nuclear physicist, so it was odd that the biggest criticism I got over the graphic was my use of the word hypocenter instead of ground zero. When objections were raised I produced my sources and asked if I should disregard a good source because Hollywood movies are in the habit of calling it ground zero. Managing editor Tom Bream confidently backed me.